The iTar Is Unfortunately Named | OhGizmo! 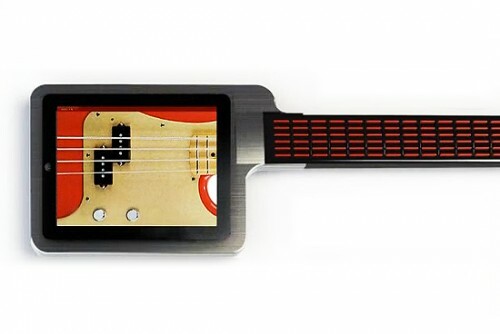 The iTar is not a real product yet, it’s a conceptual accessory for the iPad that will make it easier to turn it into a guitar. Which is where we imagine the iTar name came from: “i” and “guiTAR”. Still, at first glance, iTar looks like something nefarious, something oily and perhaps cigarette related. Or perhaps that’s all in this author’s mind and in reality it couldn’t be anything further from that. We actually do like what it will do if its Kickstarter campaign takes off. It combines a button-based guitar fretboard (Starr Labs patented fingerboard) with your iPad to create a multi-talented instrument. Dock the iPad in and you’ll be able to play, quasi-virtually, a number of instruments, not just the guitar. It can be a keyboard, a drum set, a synthesizer; everything hinges on the related application and its bevvy of instruments that are at your fingertips. Of course, the iTar will only exist if the Kickstarter campaign gains steam. As of writing, they’ve raised $4k of their $50k goal, but there are a little over 50 days left. If this is your sort of thing, the smallest contribution that will net you an iTar is $200, although you can pitch in at any level. Maybe they’ll change the name when they realize it’s a common acronym for the Internation Traffic in Arms Regulation (ITAR) laws.